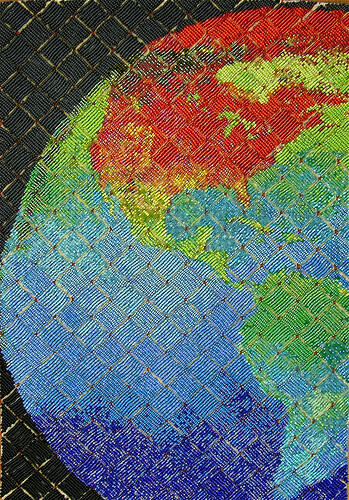 Just a quick note to feature this beautiful beadwork illustrating global warming in North America. By Peggy Dembicer on flickr. What a beautiful piece of artwork to bring attention to this threat to our global ecosystem. 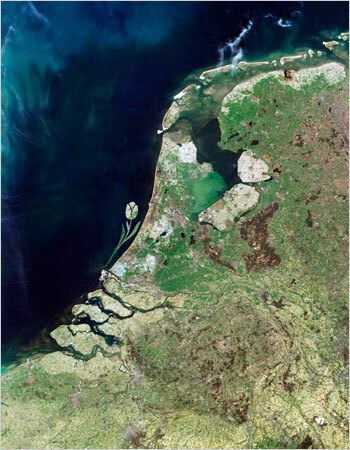 The idea, Mr. de Boer went on, would be not only to gain land and protect the coast, but also to showcase Dutch engineering skills. At the same time, an island could be an energy powerhouse, shaped like a ring to create so-called blue energy by using the contrast of fresh and salt water to generate electricity, or the ebb and flow of the tides. Wind turbines could also produce even more energy, he said. A green project all-around? I’m skeptical, but the concept is quite interesting on many levels. is a research organization involved in exploring, examining, and understanding land and landscape issues. The Center employs a variety of methods to pursue its mission – engaging in research, classification, extrapolation, and exhibition. But that seems to be putting it mildly. They seem to have a fascination for all the many ways that man and landscape intersect for good or for bad. And their medium is based in the visual. They have many other books, online features, newsletters (going back to 1995! ), and exhibitions on everything from trash to parking spaces. I’m going to have to spend a lot more time checking them out. In the categories of maps and carbon emissions, I present Project Vulcan (and it has nothing to do with Star Trek, except perhaps some inspiration in naming). This is a project at Purdue University to distill information about carbon emissions by economic sector (power, industry, transportation) into useful visualizations. It is funded by NASA and DOE (I wonder if the administration knows about this heresy). I made a discovery today that makes me so incredibly happy. For months, I’ve been wondering why Atlanta can’t get with the program and submit its public transportation data to Google Transit. I still don’t know why it hasn’t happened, but now we have something better: A-TRAIN Atlanta Transit/Bike/Walk Trip Planner. This site is so smart it can tell you how long it will take you to get from point A to point B using whatever mode or combination of modes you choose, and it even takes into account topography and lets you change your personal walking or biking speed so you can get an accurate reflection of how much time you will need. So. Incredibly. Awesome. Green Map ® System promotes inclusive participation in sustainable community development around the world, using mapmaking as our medium. GMS supports local Green Mapmakers as they create perspective-changing community ‘portraits’ which act as comprehensive inventories for decision-making and as practical guides for residents and tourists.Mapmaking teams pair our adaptable tools and universal iconography with local knowledge and leadership to chart green living, ecological, social and cultural resources. Green Map System has been developed collaboratively since 1995, and is now active in 400 cities, villages and neighborhoods in 50 countries. GMS and its network of regional hubs and community-led Green Map projects share the award-winning outcomes through their online profiles, blogs, Green Map books and media productions, workshops and other public presentations. This website is the gathering point for both the makers and users of Green Maps, and offers many inspiring resources including our new organizational booklet to anyone interested in a sustainable future. Online since 1995, GreenMap.org was re-launched in May 2007, with an exciting new presentation-collaboration-resource center for Mapmakers (we named this content management system the Greenhouse for its ability to cultivate and preserve our diverse ‘garden of Green Maps’). At that point, there were 400 registered Green Map projects from 51 countries. Find a List of all at About the Mapmakers along with more background. In the continually expanding Maps section, find fresh, new locally-authored illustrated profiles and Green Maps from all parts of the world! If you haven’t heard of mountiantop removal, you are about to be in for a shock. Many people do not realize that a large portion of our electricity still comes from coal and that the preferred method for mining coal today involves the literal removal of the tops of mountains in the Appalachians. This method is extremely damaging to the forest, rivers, and to communities. I read an excellent book about the process called Lost Mountain by Erik Reece last year, which I highly recommend. A non-profit group called Appalachian Voices has created a fantastic mapping application that you can use in Google Earth or on their website to view images of the destruction and now to figure out how you are directly connected to this awful process. Robert F. Kennedy has written about the website more eloquently as have several other scientists/activits/authors here.